Successfully Added Computer and Component Video to HDMI Converter Box to your Shopping Cart. 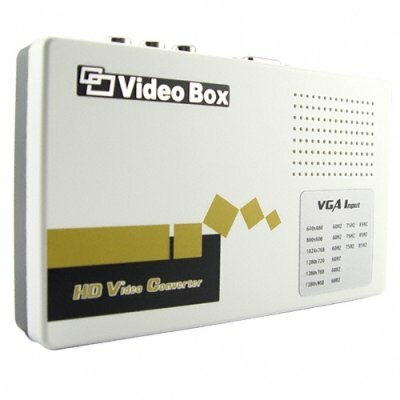 Computer and component video to Hi-Def TV converter box. Want to surf the internet on your new high definition big screen TV? Want to share the digital media and holiday photos on your computer with all your friends or relatives sitting in your living room? Here is your answer! The new computer and component video to Hi-Def TV converter box! Now you can easily send your computer video signal to the HDMI port of your new television. Simply plug in the computer VGA output cable into one end of the converter box and attach the HDMI cable into the other end and you are ready for viewing. Great for both business and personal use, and can work with any type of HDMI video display such as LCD, Plasma or Projector. In addition, this unit also converts component output to HDMI so you can use older home AV devices and game machines on your Hi-Def TV. Again, simply plug in the component YpbPr cable into one end of the converter box and attach the HDMI to the other end and you are ready to start using your other AV devices through the HDMI port of your new TV. Another great digital accessory brought to you at a rock bottom wholesale price. Easily sell this to your internet store/EBay customers for great profits and take advantage of Chinavasion's drop shipping and M.O.Q. (minimum order quantity) service for maximum convenience. HDMI converter box - convert computer and component device output to HDMI. Converts both video and audio signal to HDMI. Easy to setup and use. No special tools needed.